1. Immigrants who have received credit for 40 qualifying quarters of work in the United States. Credit is earned for each quarter when you receive the minimum income required by the Social Security Administration. For 2019, the minimum income per quarter is $1,360. Additionally, immigrants can receive credit for quarters earned by their spouse during marriage and by their parents while the immigrants are under 18 years of age. 3. Self-petitioning widows, widowers, battered spouses and children who have an approved Form I-360 are also exempt from sponsorship. 4. If you are applying through your status as an asylee or refugee. For all other immigrants, a sponsor is necessary to receive permission to live in the United States. Prior to allowing an immigrant to enter the United States, the government wants to make sure that each immigrant will be taken care of financially. Immigrants may be found “inadmissible” (unable to enter the United States) if there is any concern that they may become a public charge, and as such will require additional government support. The solution is to assure that each potential immigrant is sponsored by a person or organization with the means to support them upon entering the United States. How much do I have to make to be a sponsor? If a potential sponsor’s income is lower than 125 percent of the Federal Poverty Guideline, there are still options for them to help their loved ones. These additional values could help them still qualify for sponsorship. 1. The incomes of any relatives or dependents living in your household or dependents listed on your most recent Federal tax return can also be counted towards your total household income. If you intend to include the value of any additional members of household in your income, make sure you fill out the I-864A, Contract Between Sponsor and Household Member. If both of these conditions are not met, the immigrant’s income cannot be counted. The only exception to these requirements is if the intending immigrant is your spouse, in which case their current residence does not have to be the same as yours. 3. The value of your assets, the assets of any household member who has signed the I-864A, or the assets of the intending immigrants may count. Assets include any property that can be converted to cash within one year and without undue harm (physical or financial) to the sponsor or his or her family members. 4. If none of the above options work in a situation, then a joint sponsor may be necessary to help satisfy the income requirements. What is a joint sponsor? Earning an income that is 125 percent of the Federal Policy Guidelines, either through their own income, the income of their household, or their assets. How do I become a joint sponsor? Each joint sponsor must fill out a separate I-864 form. In their form, they will include the names of all immigrants that they will personally be sponsoring. In the case of two joint sponsors, each sponsor will only list the intending immigrants for which they will take legal responsibility. Since this is a very important and technical form, it is very important that it is completed correctly. Included here are the steps to complete this document. Feel free to fill out the form with me as I explain the different steps of this form. How do I fill out the I-864 as a Joint Sponsor? The I-864 document consists of 11 parts. This will walk you through how to fill out each step. Every sponsor, no matter what kind, will fill in their own name in the first box of the section. If you are the only joint sponsor, mark the 1.d. Option. If you are one of two joint sponsors, mark the 1.e. Option. In this situation, each sponsor must be labeled as either the first or second sponsor. The information in this section will be about the principal immigrant that you are sponsoring. In items 2.a. – 2.i., include the address of the principal immigrant. Items 3-7 consist of additional information about the immigrant. Only items 3,4 and 7 (the Country of Citizenship or Nationality, date of birth, and telephone number) are required. Items 5 & 6 (Alien Registration Number and USCIS Online Account Number) are not required, but will make the process easier for the immigration officials if they are included. If you are the only joint sponsor, or you are the joint sponsor for the principal immigrant, you will mark Yes on item 1. If you plan to sponsor additional immigrants who will immigrate more than 6 months after the principal immigrant, mark item 3. 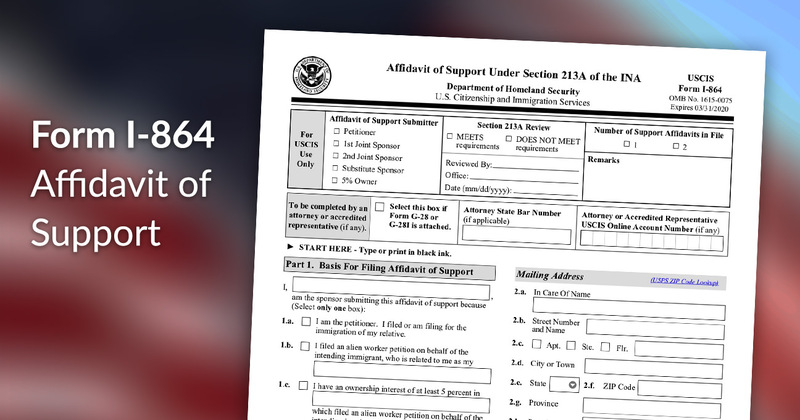 In items 4-28, you will include the information of any additional immigrants on top of the principal immigrant who you personally will be sponsoring. If you are only sponsoring the principal immigrant, you do not need to include their information again. In item 29, you will enter the total number of immigrants that you will be sponsoring. In item 1, you will include your own name. Items 2-4 will consist of your mailing and physical address. If they are the same, then you can simply mark Yes in item 3, and skip item 4 completely. Items 5-10 are all required information about you. If your address from items 2-4 are outside of the United States, but your country of domicile is the United States, you must include a written explanation. For item 11, specify if you are a U.S. citizen, national, or permanent resident. Since you are not a petitioning sponsor, you will not fill in item 14. In this section we will establish your household size. Therefore, all the inputs you add in this part will be numbers. Item 1 will be the total number of immigrants that you are sponsoring. This should be the same quantity that you entered on Part 3, item 29. Item 2 should be 1, to represent yourself. If you are married, you will add a 1 for item 3. Otherwise, add a 0. If you have any dependent children (unmarried and under the age of 21), add the number that you have in item 4. Otherwise, add a 0. If you have any other dependents living in your household, write down the number for item 5. Otherwise, add a 0. If you have sponsored any other immigrants, mark the number for item 6. Otherwise, add a 0. In item 7, you will include the number of any additional household members who are not dependents, but that you will be including in the total household income. Item 8 is the total of items 1-7. The total found in item 8 is the quantity that use to refer to the chart at the beginning of this article to find the exact amount that you must be making to be financially responsible for the immigrants that you plan to sponsor. Keep this value in mind while we calculate your household income in the next part. Items 1-6, will show how you receive your income. If you are employed, mark item 1 and include your employer’s name in item 2. If you have a second employer, you can add that in field 3. If you are self-employed, mark item 4. If you are retired, mark item 5. If you are unemployed, mark item 6. In item 7, write your total annual income. This should be the same amount shown on your employer letter and pay stubs. Do not include anyone else’s income in this amount. In items 8-19, you will include the information of any additional members of household who you will count towards the total household income. Item 20 will be your total household income. You will add up your own annual income and the incomes of any other members of household listed in items 8-19. Mark item 21 if the additional members of household filled out a Form I-864A. Mark item 22 if one or more of the household members who are adding their income to the total are intending immigrants. They will not need to fill out a Form I-864A. Items 23-25 deal with tax returns. If you filed a tax return during the last three years, mark item 23.a. You must include a copy of the past year’s tax return. The two previous years are optional. If you include them, mark item 23.b. Item 24 will include the past three years’ Adjusted Gross Income (AGI). Make sure to put your exact AGI found on line 37 of the 1040 and line 21 of the 1040EZ. If you were not required to fill out a tax return, mark item 25. Items 1-4 consist of the value of your assets. In item 1, put the value of your savings and checking accounts. In item 2, include the net value of your real estate holdings (net value is the total value minus any mortgage debt). In item 3, include the value of any assets not already listed. Item 4 will be the sum of items 1,2 and 3. In item 5, you will include the assets of any other relative who you are including in your total. This person must have filled out a Form I-864A. Items 6-9 will be the value of assets of the principal immigrant. Item 10 is the total value of assets calculated in Part 7. Part 8 goes into detail about the specific responsibilities. Most of the details discussed here were mentioned at the beginning of this article. You are encouraged to read through this section prior to signing the Form I-864, as this is the exact contract that you must follow. In item 1, you will state whether or not you received assistance from an interpreter. Item 2 concerns whether or not you received help from a preparer. In item 3-5, you will include your contact information. Item 6 is your signature. This is the most important part of the form. This is what will validate the entire affidavit. Make sure you clearly understand what is expected of you before you sign this part of the form. If you did not receive the help of an interpreter in filling out this document, you can skip ahead to the next part. If any part of this form was interpreted for you, you must include the contact information of the interpreter in items 1-6. The interpreter will then sign item 7, which states that they correctly explained every part of this form to you. This section is only necessary if you had another individual’s help in completing this form. If you completed it by yourself, you can move on to the next part. If you received help in completing this form, then you need to include their contact information in items 1-6. In item 7, the preparer will state whether or not they are an attorney. The preparer must sign in item 8, stating that they prepared this document for you to the best of their ability. The space given in Part 11 is specifically for the purpose of giving you extra space in case you were not able to complete one of the previous questions in the space given. You can print out as many of this form as you need to complete each part. If you have reached this point, congratulations! You have finished filling out the I-864 document! What else should I know about the Form I-864? There are some questions that come up frequently about filling out the Form I-864. Here are some of these questions. How long am I held responsible? It is important to note that if you are sponsoring your spouse and go through a divorce, you will still retain your sponsorship responsibility. How does sponsorship affect the public benefits received by immigrants? Additionally, each state provides other benefits that are included in the “means-tested public benefits” category, and these may also be denied to immigrants. Make sure to familiarize yourself with the specific list for your state before signing the I-864 document. In some circumstances, the immigrants access to public benefits may not be denied by the government. This does not mean that those benefits will come free of cost to the sponsor. Some sponsors may be asked to repay the cost of the benefits used by the immigrant. Failure to repay the cost of these benefits may result in a lawsuit. Again, we encourage you to check with an attorney before allowing your sponsored immigrant to receive government funded benefits. There are several documents that should be included with your application. You should also include evidence of your current employment. This can be done through providing 6 months of pay stubs and a letter from your employer. The letter from your employer should show your time at the company, current salary, and position. It can be provided by HR or your manager. If you are unemployed, you should still find a way to prove you have the means to support the immigrants you are sponsoring. If you are counting on the incomes of other members of your household, you can include their pay stubs with your application. Additionally, if you are including the values of specific assets, such as your house, you can include an appraisal of the asset to prove its value. All of these documents will help prove the validity of your claims. Including them will help prevent against the USCIS filing an RFE (Request for evidence). If the government feels that not enough information is supplied, they may put a hold on your process until you provide additional evidence. These documents will provide that proof for them. Hopefully this guide is helpful in filing your own joint sponsorship paperwork. Now, please do not use this guide as your only source of information. This is a very complicated document, and it would be wise to consult an attorney to make sure that all the information is complete prior to filing the I-864. SimpleCitizen includes the Form I-864 in their complete green card immigration paperwork service. Go to https://start.simplecitizen.com/ to start your application today. Daniel is a Pre-Business student at BYU. His passion for people and cultures sprouted from his experiences growing up in Southern California where he realized that, although separated by political borders, people from around the world have much in common. He learned Spanish on a two-year humanitarian trip in Colombia and gained a special insight into the problems facing residents of developing countries. He looks forward to using his skills to help give others the opportunity to achieve their goals.